The most popular Q&T wear plate in Australia is the 400 grade plate with its high hardness, abrasion resistance and controlled-carbon equivalent to optimise welding. However, we can supply plate ranging in hardness from 400 to 600HV to meet your application and requirements. 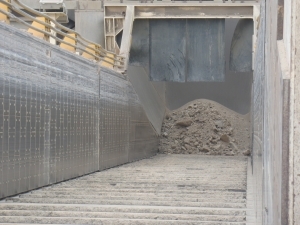 Areas of fixed plant such as wear liners, chutes, storage bins, hoppers, cyclones and deflector plates benefit from this cost-effective structural steel. Knowing where to use it and where to package the various grades of Q&T plate with PACplate, ceramics or Domite® is where we excel. We have the product range and knowledge, technical expertise and down-to-earth service to find you the right wear solution, everytime. Our superior product range is backed up by fast delivery and the highest level of service and support. Committed to the longevity and efficiency of your operations, we offer regular on site inspections, wear audits and performance evaluations to identify appropriate, cost effective solutions for all your wear, plate and block needs – when and where you need it most. Talk to us today, we will fix your problems.